Discussion in 'iPhone and iPad Games' started by Jayg2015, Dec 14, 2016. 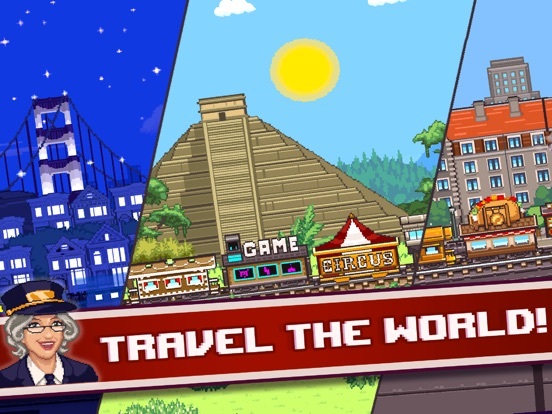 Manage your train company from modest engine to multi-car masterpiece in this immersive, world-spanning game from Tiny Titan Studios. 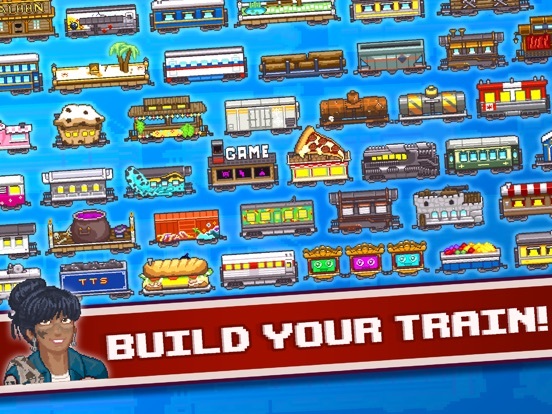 Deliver passengers and cargo across the world, while upgrading and customizing your train cars to become the ultimate railroad tycoon! 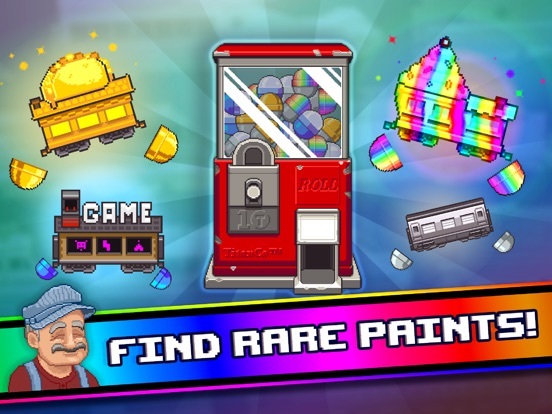 Features Include: •Packed with gorgeous retro pixel art and relaxing music! 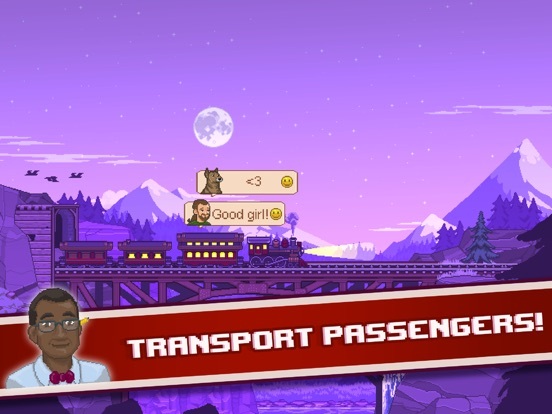 •Your train runs in the background even when you’re not playing! •Outfit your train with food, entertainment or comfort cars to increase passenger happiness and keep business booming! 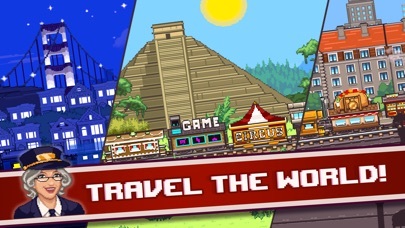 All aboard for an adventure around the world! Tiny Titan Studios keeps producing pixel hits and this is another 5star gem. A simulator tycoon game that offers so much content in such a "Tiny" game. Upgrades, rewards, quests... it has it all. I can't wait to jump back into this game. The pixel-art looks great, I will definitely hop on board and give this a run. Always great to support Canadian game developers. I'm really into this game . A lot of depth and unlockables and upgrades. I feel slightly odd. I've just spent about 20 minutes gazing at a pixelated train going from station to station doing very little but loving every minute of it. 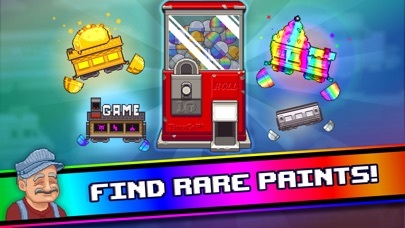 There is a huge FTP element going on here but so far (admittedly only an hour or so in) it seems quite generous - lots of opportunities for ads for premium gems going on, you know the usual stuff. I suspect one of two things will happen I'll either hit a paywall and get very bored very quickly or I'll end up spending the next month of my life on it. Hoping it's the latter - there's no excuse not to give this a go, leaving aside it's FTP there's a lot of charm to it. And just after posting that I've come across a minor bug - If you move to another app (for example to post on TA about how much your enjoying it) and don't actively close the game down then time doesn't move on. It's fine if you actually properly shut it down though so by no means a game breaker. (Air 2 latest iOS). We should have this fixed in the next build submission planned for tonight! Force closing to app has its problems too. I had 90 gems and bought a rare car. Then force closed the app and when I cam back I had my 90 gems back and the rare car was gone. I was able to do this over and over till I got the rare car I wanted. Well, after my first night, this seems like a solid idle game. Standard fare of most idle games, pick a few options to set up a little economic machine, and then reinvest your profits and watch it grow. Premium currency is handed out via quests and by volunteering to watch ads, at rates that seem pretty generous. The premium currency is mainly for a gachapon system that provides you with most of the options to maximize your income or personalize your train. The art is great, watching the little train chug through surprisingly varied landscapes is a pleasant way to waste some time. Currently the game has a few UI issues though. 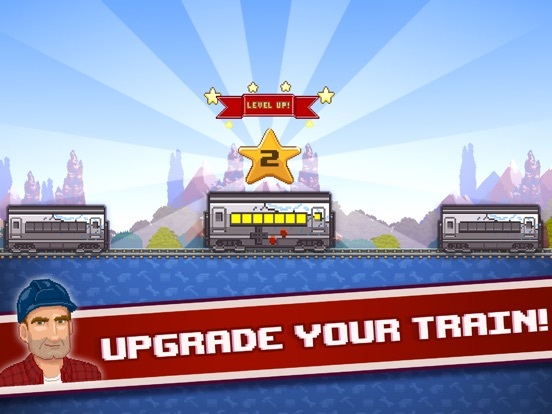 The assemble train interface can be finnicky, often making swapping train cars out harder than it should be. The game also seemingly hides two very important numbers from you. One, the weight of your train cars, the main limiting factor for your train, are not listed, so you end up just doing trial and error setups to try and get under the weight limit. Second, there is a way to upgrade the maximum amount of gold you can hold, but there is no way to check what your current max is without maxxing out and wasting some gold. Overall, it is a fun game little game with no real deep rooted issues, just a few rough edges that need to be ironed over. 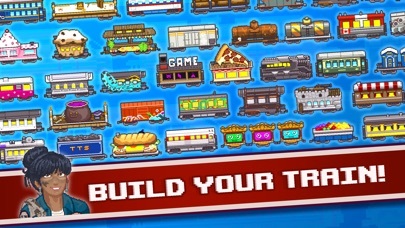 I'd reccomend it to anyone who is a fan of idle/economic games, pixel art, and trains. I'm having problems saving - to get the distance to register the app has to be force closed, but it keeps losing my progress - it doesn't seem to save very often. When exactly does it save, is it only when it gets to a station or something? Wait, Dover is a station on the map but Philadelphia is not? The PRR was the largest railroad by traffic and revenue in the U.S. for the first half of the 20th century. Over the years, it acquired, merged with or owned part of at least 800 other rail lines and companies. At the end of 1925, it operated 10,515 miles of rail line; in the 1920s, it carried nearly three times the traffic as other railroads of comparable length, such as the Union Pacific or Atchison, Topeka & Santa Fe railroads. Its only formidable rival was the New York Central (NYC), which carried around three-quarters of PRR's ton-miles. This is actually a really good game! Great for relaxing - not too hard and just eases you in. I especially love the big map, stat tracking, and collecting trains. There are some big bugs. Saving seems to only be guaranteed after you reach a station so you have to wait for it to reach a station before you can close the app. Really troublesome for long distances. Also, diamond rewards from the settings screen don't work - they never get added to your diamond balance. So overall it's a great game, just needs some fine tuning. I recommend this one! Is there some way to stop in a city, or is the entire point that the game keeps rolling and you need to visit markets and such on the fly? We're really excited for the launch of this title and it's great to see so many people are enjoying it and having positive experiences with it so far. Thanks so much for offering your feedback. For iOS players, we're aware of issues with data being a bit flaky on suspend/resume. We've got an update currently waiting for review that should address those issues along with some others. Someone had also asked about the ability to stop at stations. By design, the game was built to have the train constantly remain "in motion", but we were discussing this very matter last night. We're looking at a way to implement a "station pause" or something to that effect, at least at a preset waypoint. Stay tuned for more on that. We'll be continuing to try and massage a few of these features as we proceed through our launch weekend. Thanks again for checking out the game and offering such great feedback, everyone! Only played a few hours, but so far it's fun and I really like the pixel graphics! Also, diamond rewards from the settings screen don't work - they never get added to your diamond balance.! Edit: is it a bug or a feature that the train is "standing still" when watching ads? 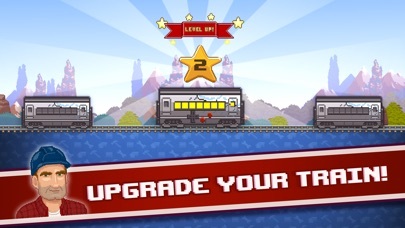 It would be a great way to pass time if the train moved while watching the ads.